The bacta tank, also known as a rejuvenation tank or a rejuve tank, was a large, specialized tank that was filled with the powerful healing agent created by the Vratix, bacta, which promoted rapid healing. 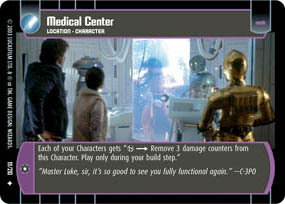 A bacta tank and a supply of bacta were expensive, the tank alone typically costing 100,000 credits from 32 BBY to 8 ABY, and so such medical equipment was usually found only in hospitals, on board capital ships, and within major military bases. Movement of bacta tanks could prove difficult because the tanks weighed roughly 500 kilograms. A patient was required to be fully submerged within the bacta for the healing agent to do its job. Patients wore breath masks to breathe while submerged. Patients while in the bacta tank wore either white briefs for males or a white sleeveless top and briefs for females. Certain species, such as Rodians, experienced complications with the bacta due to their metabolism, sometimes requiring extended submersion. Although bacta was near impossible to acquire during the reign of the Galactic Empire, the Rebel Alliance obtained a functional bacta tank and a small supply of the liquid for use at Echo Base. After being attacked by a wampa and spending the night on the frozen wastelands of Hoth, Luke Skywalker would have almost surely died from his injuries if not for Echo Base's bacta tank. After the Battle of Endor, the New Republic initiated a Bacta War to liberate the remaining bacta and spread it across the galaxy.